Cardhu is another in Diageo’s extensive portfolio of Scottish distilleries. Located in the Speyside, Cardhu is a pretty old distillery but has maintained a fairly low profile in single malt form–Whiskybase records very few independent releases from Cardhu and the Malt Maniacs database lists even fewer. This 12 yo is the only regular official release I think, and it has only relatively recently made its way to the US. I’ve tried it on a couple of earlier occasions but in social settings where I couldn’t really pay attention to it; and so I’m happy to be able to spend some time with a large sample. Nose: Honeyed malt and heather. Bright and fruity: some citrus and some sweeter fruit (peach? cherry?). A little grassy as well. Gets sweeter and maltier and creamier as it sits; more vanilla too now. With even more time the fruit gets musky. A very nice nose, especially for a young whisky bottled at 40%. Water brightens the nose up a touch. Palate: Not quite as fruity at first on the palate as I was expecting. Instead there’s some toasted wood and spicy notes (rye, cinnamon) at first and then malty sweetness. With time there’s musky fruit on the palate as well (melon, a slight hint of papaya), balancing the woody notes–not a whole lot but just enough to make it interesting. Water makes it a little more acidic and makes the musky fruit recede. Finish: Medium. Wood and spice dominate. Comments: No world beater but a textbook Speysider of its type and a very pleasant easy-drinking malt. I’d take it over the current Cragganmore 12, especially if found cheaper. A good gateway malt to offer to guests who usually drink blends. Would probably be much better at even 43%. Now, what are older Cardhus like? Anyone had one? This entry was posted in -Whisky by Rating, 80-84 points, Cardhu. Bookmark the permalink. The standard official releases are 12, 15 and 18yo but it could be the case that they are not for the US market. I admit they are not as widely spread as the 12yo but are still regular releases. I can easily find all three in Bulgaria. Thanks! Who knew? Well, you did. How do they compare to the 12? I recall reading that Cardhu’s biggest market is Spain. 15yo, 18yo, and “special cask reserve”. A google search also turns up a 21yo version. According to the Whisky Exchange, Cardhu used to be 43%. Too bad that strength didn’t stick. 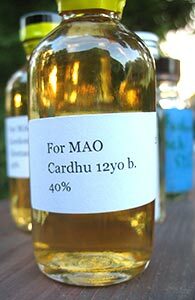 It’s interesting that Cardhu doesn’t have a Distiller’s Edition. I’ve tried a 1984 27yo from the SMWSA that was fairly excellent. It surprised me, nothing earth-shattering or terrifically unique, but like this 12, it was just solid stuff, well balanced, really nice progression. It gave me more respect for the distillery, that’s for sure. Great review!